Erik Matti of the Philippines is a leading figure of Southeast Asian genre cinema. His new feature BuyBust, also included in the NYAFF, is his first pure action film. This one from 2013, also in the festival, is highly admired. It gained him international notice through inclusion in Cannes Directors' Fortnight, and was a New York Times Critic's Pick when reviewed by Jeannette Catsoulis. It shows Matti's élan and brilliance as a filmmaker. 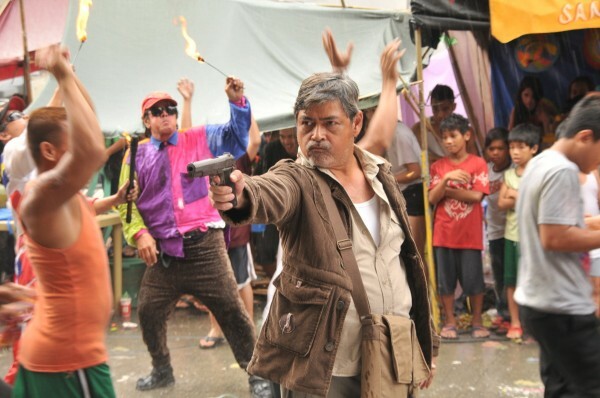 Mario aka Tatang (Joel Torre, who looks like Argentine star Ricardo Darín) is the central figure here, and the central relationship is between him and his cocky protege, Daniel (Filipino-American Gerald Anderson). Both are hit men, and both are prisoners. They are let out to do a hit, then go back in, a perfect cover. They live as ordinary prisoners - it's important to maintain a low profile - in a prison that's more like a cross between a fantasy boy's school and a teeming slum with gay-dominated independent laundry and food services. Tatang explains the game to Daniel, and is with him when he does his first and subsequent hits. The first hit is done by Tatang right out in the open in a crowded and chaotic market place location that's like something in the Bourne series, but more organic. Parallel to this pair is Francis, a classy, clean cut, and model-handsome NBI (like the FBI) academy grad (Piolo Pascual, a Manila TV matinee idol) who becomes the protege of principled cop Acosta (Joey Marquez), but whose key relationship ultimately is with Manrique, a powerful politician (Michael De Mesa), due to marrying his daughter. That marriage, Francis learns, puts him in line not just for distinction in law enforcement but possible high political office. But before long he learns the assassinations have a source close to Manrique, and the whole system is rotten. Manrique schools and advises Francis as Tatang tutors Daniel. Francis is investigating the assassinations, which we learn are by hit men from various prisons. At first the film cuts back and forth seamlessly between these two stories without our understanding them or their connection. Also confusing is the fact that the two men not only hide from fellow prisoners what they're doing on the outside but hide from their families that they're even in jail. Tatang's family, including a daughter in law school, which he visits, thinks he's simply working in another town. Daniel only calls mom and pretends he's got a job in Dubai. It's all dark, messy, loud, and chaotic. But it's also got atmosphere you could cut with a knife. Our attention is held by the world-class gritty authenticity of the action as staged by Matti and shot by dp Francis Ricardo Buhay III, the skill of the editing by Jay Halil, which makes the film enjoyable even before we understand it, and the punchy score by Erwin Romulo, which adds pizzazz precisely when and where it's needed. Call this genre, call it a B picture or merely workmanlike, but up to the inevitable Godfather-style hospital kill and chase that leads to an action showdown linking cops, hit men, and politicoes, the writing by Matti and screenwriter Michiko Yamamoto is skillful in making all elements convincing. They draw us into Tatang and Daniel's weird lifestyle so thoroughly we start to worry when we learn that, now that Tatang has been notified he'll soon be released from prison, his job is over, and he may be put on Daniel's hit list. On the Job makes you enter a full-fledged other world, and Matti uses this B-actioner mode to critique real Filipino corruption and violence. On the Job, 118 mins., debuted May 2013 in Cannes Directors' Fortnight and has been in at least 13 other festivals. Its Metascore was 70%. This film was also featured at Toronto last year. It is being revived for the 2018 NYAFF at Lincoln Center, where it shows July 14 at 12:30 p.m.